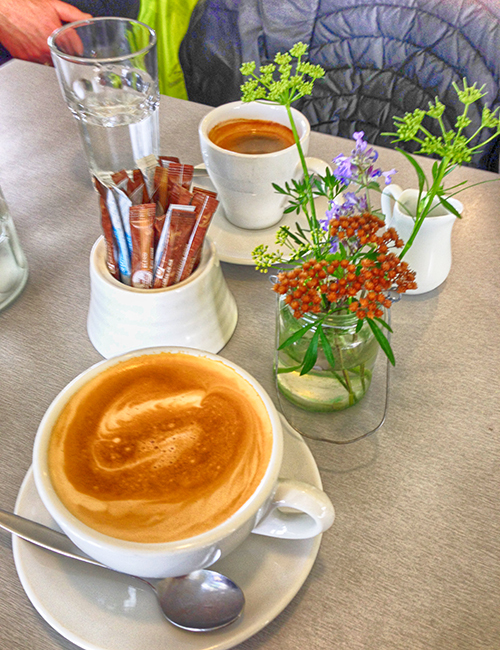 New Zealand’s favorite coffee drinks: a long black (top) and a flat white. Photo by David Lansing. One of the things that has really surprised me about New Zealand is just how serious Kiwis are about their coffee. You can go to some tiny little café in the middle of the wop wops and almost invariably you’ll get a most excellent cup of coffee. You see the photo up above? At the top is a long black and at the bottom is a flat white. This is pretty much what everyone in New Zealand orders. A long black is easy. It’s just a double shot of espresso topped with about four or five ounces of hot water (in other words, it’s like an Americano only stronger). A flat white is a little more complicated. It’s related to the cappuccino and similar to a latte, but different. In general, a cappuccino is a single shot of espresso topped with very foamy milk. I’m not a big fan. I hate getting that mouthful of foamy nothingness before you get to the coffee (also, they’re usually served lukewarm, which I hate). A latte can either be a single shot of espresso or a double but just to make the comparison with a flat white easier, let’s say it’s a double. So you pull a double shot and then you aerate your milk, making it not as foamy as you would for a cappuccino, and you pour that on top of the espresso shots. So you still need to sip through the milk foam to get to the espresso but there aren’t as many bubbles. A flat white, on the other hand, is meant to integrate the shots of espresso with the hot milk. The key to making a great flat white is, one, stretch the milk with no bubbles and, two, integrate the stretched milk in to the espresso shots while keeping the crema on top. What you need to do is hold the coffee cup with the two shots of espresso at a slight angle while you gently pour the stretched milk on to the side of the cup. You want the milk to go under the crema but mix in with the coffee. You do this slowly and when the mixed coffee-hot milk mixture is almost to the top of the cup, you layer on the thick, smooth stretched milk cream on the very top. Now, when you take a sip, what you’re going to get is a nicely blended cup of espresso mixed in with the stretched milk. The perfect flat white.